Get inspired by this amazing weight loss success story. 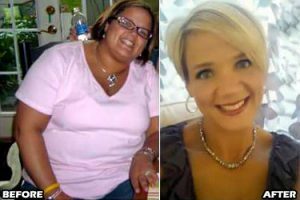 Hope this motivational story will help encourage you to start your weight loss journey so you can be successful at reaching your fitness goals. This inspirational story include in-depth interview with real person who has been successful at losing weight by eating a healthy diet and following a calorie burning exercise plan. I really hope you will get inspired by reading this story and learn important diet and exercise tips to get you started on the right track to success. From January 3, 2014 through July 28, 2015, I lost 123 pounds and went from a size 24 to a size 4! I did it without any surgeries or medications. I have struggled with my weight most of my adult life. 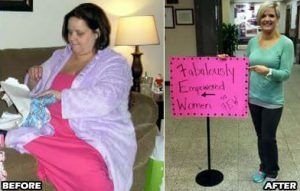 After my divorce, I was 266 pounds and bigger than I had ever been. I was 41 years old. I felt like my life was literally half over and I had nothing really to show for it. I was divorced, depressed and wanted more. I didn’t want the next 40 years to be wasted. I was sitting in the bathtub scrolling through Facebook before getting ready for work that day and read an article about what sugar was really doing to our bodies. Something clicked for me at that moment. I got out of the tub, went straight to the kitchen, pulled out a big trash bag and cleaned out my kitchen of all the sugary foods. I mean everything! That single determined action changed the entire course of my life! If you just change one thing, you can change everything! The most important change was learning to believe in me. I had to learn to change how I thought about myself in order to change my body. I became empowered every time I made a healthy choice. The stronger I got, the more powerful I got! It was all about getting my head right. I used a motivation board to help my brain believe that I could do it! Once my brain began to believe it, my body followed! I learned to dream big, believe in myself and take action. The single most challenging thing I had to deal with was myself. There is no bigger obstacle than ourselves! But by pushing through the bad days, even when I didn’t feel like it, I empowered myself! I lost 42 pounds by the end of April, 2014. I was still very big and it was hard to tell physically, but I felt so much better! I had more energy than I had in years and my clothes weren’t fitting me any longer. That was a turning point for me and I was beginning to feel good about myself again! It took a total of 19 months for me to lose 123 pounds. The most important factor for maintaining my weight loss is consistency and a total lifestyle change. 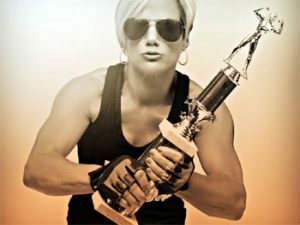 I have become a personal trainer and opened a business called Barbell Butterfly which is a women’s total body transformation program I put together based on my own successful transformation experience. I want other women to know that they really can do this too! My business is growing while helping other women become successful on their own weight loss journeys. I believe in eating clean and lifting weights to get healthy and fit. 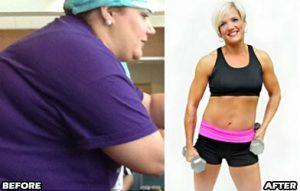 These women are doing it too and seeing amazing results! Barbell Butterfly is what keeps me in check. I am also very goal oriented. I am always setting new goals for my body and pushing it to a new limit! Each month, I set lifting and workout goals that keep me pushing forward. My life is completely different! My body has totally transformed and my life has completely changed. I have started a women’s health and weight loss support group called “Fabulously Empowered Women”. We meet every other Monday night at a local fitness center to encourage each other on our weight loss journey! In July, I took a Personal Trainer’s Class and received my Personal Trainers Certificate so I can help other people learn how to exercise and take care of their bodies! I have started a growing business to educate women on eating clean along with visual motivation, goal setting and weight lifting in order to transform their bodies. Everything is so much different and I love my life now! 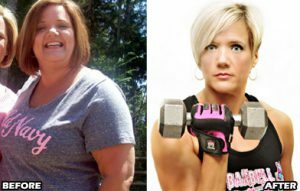 Lynn’s Weight Loss Eating Plan! Protein shake, Ezekiel muffin with almond butter. Grilled chicken, steamed veggies, black beans. Fish or other lean protein and steamed veggies. Almonds, cottage cheese, half an avocado, berries, Greek yogurt, rice cake with almond butter. CLA, multivitamins and whey protein shakes. I do HIIT workouts on the elliptical machine. I usually do 30 minutes of cardio after my weight training workout. Don’t be afraid to dream big. Visualize the body that you want and own it! Believe in yourself! Make a motivation board to help your brain stop all of those negative, self-bullying thoughts. The motivation board helps put positive thoughts into your head and your brain will begin to believe it. Cut out sugar and eat clean. Sugar literally makes us sick. Eating clean is how our bodies are designed to eat. Focus on lean proteins, complex carbs and eat small meals frequently throughout the day. Stop the cardio madness! Yes, we need cardio to help us burn fat but building lean muscle tissue is what keeps our metabolism revved up and on fire. When you gain muscle, you will burn fat even while you sleep! Weight lifting and resistance training is also great for osteoporosis, depression, anxiety, weight loss and so many other things! Not to mention you can sculpt your body into a strong, lean and beautiful machine! Smash your scales! Scales are defeating and tell us nothing. We are never happy with whatever number they give us. Even when we lose weight, we always think “That’s great, but…” so get rid of that self-defeating thing!